For the unique events try our stars.These are approx. 1" lightly veined, perfect for patriotic, heavenly weddings or seaside functions. 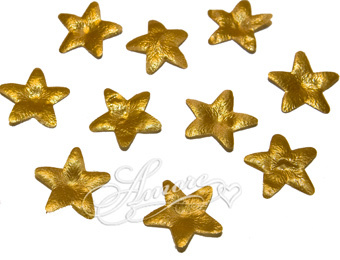 How about shooting stars for your affair.That will get everones heart beating fast.These lovely stars comes in bright white,gold and true red, they have texture,this shows depth. May we suggest mix together and add our Navy Blue rose petals #232 for a lovely patriotic affair.Mix our stars with our hearts,the combinations are endless.When you make upyour favor pouches add a few stars to remind guests what you think about them.